I had a half day at work, motorcycle loaded up, 170 miles to cover, time away from kids, lovely dry weather and a pub dinner booked with family in 6 hours time. It doesn’t really get much better than this. 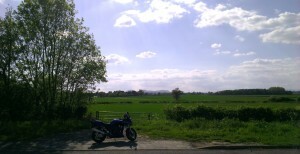 It turned out to be great ride up to Shropshire, cross country through the Cotswolds, Worcester and South Shropshire. Here is how I got on. I left work after lunch and immediately cut straight up across the city via Islington, Highbury etc along the A1, before hitting the North circular and then out of London on the A41. This first leg was a little slow going due to traffic, but later on the A41 was almost empty. 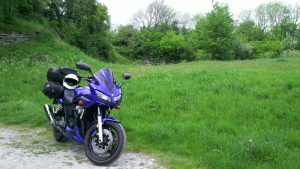 A fast dual carriageway with big sweeping bends leading to Aylesbury, a nice easy ride through green countryside, but not the fun country bends I was looking for. Aylesbury is a nice small town, but straight through I went continuing on the A41 to Bicester. The road was mostly single carriageway, but with occasionally stretches of dual carriageway. The scenery was pleasant, highlighted by passing the majestic Waddesdon Manor, but nothing compared to beyond Bicester as I entered the Cotswolds. Out of Bicester I took the B4030, a winding road that cuts across due West through some picturesque villages. Lovely countryside, quaint villages, undulating hills and some great bends to negotiate. A real highlight of the whole route, well worth checking out. The B4030 ultimately joins up with the A44, which snakes across the Cotswolds and all the way to Worcester. 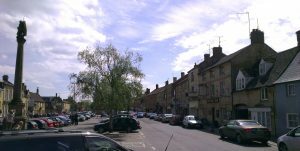 I passed through the lovely towns of Chipping Norton, Moreton-in-Marsh, Bourton-on-the-Hill and Evesham. All an interesting ride, some straights, some bends, some hills and a few steep and winding declines. Especially near Broadway, as the road took a series of sharp hairpin bends on a 10% slope. Don’t think I’ve ever had the bike as far over as I did here! The sun had come out, shades were on, the surrounding countryside green and very few hold ups on the road. Happy days. I made a quick pit stop in Moreton-in-Marsh for refreshment, but time was ticking on, so didn’t explore the town much. The A44 then crossed the M5 and headed onto Worcester. However, a wrong turn on my part sent me into the city centre during rush hour, rather than skipping around the North of the city. Whoops, good job I’m no stranger to filtering in the city, as I piled straight down the middle of grid lock in both directions and crossed town in 20 minutes. Careful now, car drivers here aren’t used to the progressive filtering that is the norm in London. And watch those bus lanes, they don’t want bikes in them! Onwards to Kidderminster on the A449, a road that was once a dual carriageway, but now painted up with right hand turn lanes every half mile (with solid white line boundaries) and 50 mph speed limit (with a couple of speed cameras too). No fun to be had here. But onwards I went, round the Kidderminster ring road and out towards Bridgnorth on the A442. This is where the journey gets exciting again. 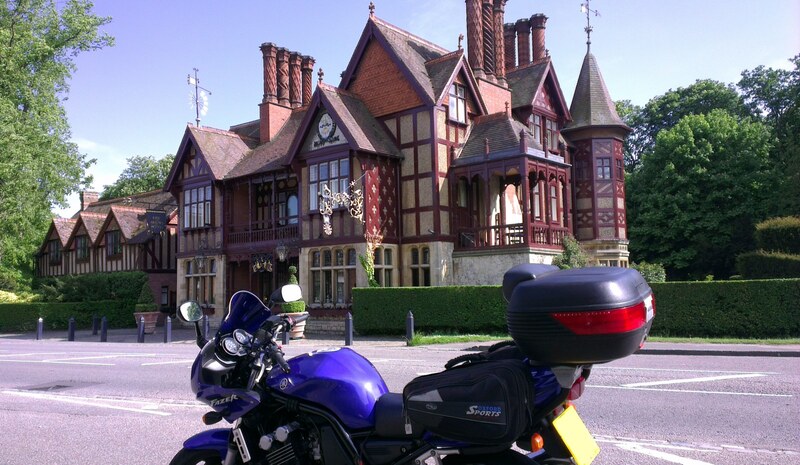 Back into Beautiful countryside, Shropshire now, winding roads, an ideal time to get more cornering practice. The pace slowed a little as we approach Bridgnorth, but we hang a left on the outskirts towards Shrewsbury along the A458. More great cornering practice followed, as I passed through the village of Much Wenlock and then down Harley bank, another steep decline. This last leg is quite obviously a popular biker route as I nodded my head to dozens of other passing bikers. 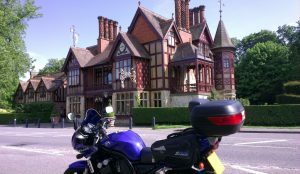 Just outside Bridgnorth on the A442, is the Food Stop Cafeteria, a popular tea stop for local bikers. Quiet on this particular Wednesday afternoon, but packed full of bikes on Bank Holiday Monday when I made my return trip. All too soon I hit the Shrewsbury bypass (A5) and neared the end of this great ride. A quick fuel stop, then a short ride to my familiar childhood home. The sun still shining, soon to set out West behind Breidden hill, a horizon I have associated with home coming since very young. For my return journey, I took almost the exact same route in reverse. However I avoided Worcester city centre, crossing the M5 at junction 6. I also took a break at Pershore, parking up next to the River Avon, before continuing onto Evesham via the B4084 and rejoining with the A44. I had another pit stop in Morton-in-Marsh and had a lovely ham sarnie at Tilly’s cafe. Finally, on reaching London, I took the M25 round and cut through to Dagenham via Theydon Bois. In total: 170 miles, approx 5.5 hours (with few short breaks). Full route on Google maps.